You must make reservations at least 5 minutes in advance of the time at 501 Prime. Hot Springs premier steak and seafood restaurant. Offering USDA Prime Beef, Fresh Seafood, Oyster Bar, Fantastic Wine list, Pub Style Beers on Tap, and one of the best Bourbon/Whiskey selections in the state. *Note: If you are unable to find availability online, please contact us directly and we may be able to accommodate. 👍. You will love this place. Expensive, my ribeye was 2/3 fat, lobster deviled eggs not to my liking, we left most of our food. Recommended by locals but not sure why? Ambience is totally lacking. We sat at a very small table, on par with McDonalds or Burger King, that barely accommodated our plates & drinks. Not a good experience for the price! I would highly recommend to anyone to eat here. Our waitress did an amazing job. Her suggestions were helpful, she was kind and polite, timed out the arrival of all of our dishes perfectly, didn’t rush us, and didn’t interrupt our evening unnecessarily. Dishes were cleared off the table quietly as we ate to avoid it from overcrowding. And the food was divine! Fabulous anniversary dinner! Ambiance was great! Our first visit here and will be back if we are ever back in Hot Springs! With all the nice restaurants I've been to in my life, this was absolutely up there with the best of them. This was our first time to 501 Prime. We were regulars at the chefs previous restaurant. The building is beautiful, but we felt like atmosphere took presidence over service and food. We had a reservation for 8:30, we were first set at the oyster bar after a 15 minute wait. After sitting a the bar for a few minutes we asked for a table. They asked if we had a reservation, we had already told the hostess. It was handled very well, not bad service just not on top of things. With the late reservation they didn't have all the items on the menu. What we did have was great We will be back, but I'm sure it will not be a regular stop for is as Central Park Fusion was. The food and ambiance were wonderful! I had the lobster deviled eggs and grilled oysters! Great food, atmosphere and service. We will definitely be back. Food was excellent. Had reservations and was seated right away. Service was very good. First time visiting with friends and loved it. Excellent service and great food. Between our group we had pork chop, steak, and surf and turf. All wonderful. Can't wait to go back and try the upstairs bar area. Fabulous oysters, drinks, tuna, steaks. Best place in Hot Springs for a wonderful meal in a beautiful restaurant. starts out with seating at the kiddy table, maybe 18x24. waiter had the vibs of just getting out of prison. we ordered oystersrock, which was good. 18oz prime rib, i took home the fat and gristle, it weighted 9.8 ozs. i had the under-cooked salmon in a bowl of i swear, instant mashers. when we both tasted the taters, our first words were, the big red box you buy at sam's. have you ever reheated a dinner roll in the microwave? 5 minutes later the roll loses its heat and is hard as a rock, welcome to 501 prime rolls. its goes without saying, but will never eat at 501 again. @ $125, the price/food value, is right on track with mcdonald's. the chef needs to eat a steak at Pete Luger's in brooklyn, $$$ but OMG real steak. My new favorite place! Highly recommend if you're looking for a romantic dinner or a great place to take clients. Our waitress, RachelnI believe, was top-notch. The food was superb. And, the ambience was perfect. My scallops were incredible. We were a party of 6 and everyone left happy. Delicious food and awesome service from Sam the bartender! 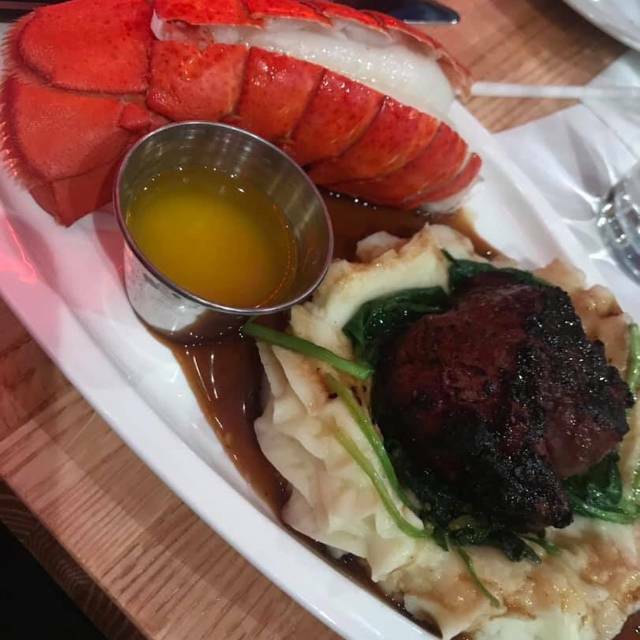 The Service was very Awesome, and the sides were great, I was a little disappointed in the steak, but overall it was a wonderful dining experience. Date night - we loved it! Our server was attentive. Food was excellent. Atmosphere appealing. We thought there was a dress code but saw several men in jeans and two women in workout clothes. We’ll ‘dress down’ for return visit. All four of our meals were splendid. Tasty and well presented. The entire evening was excellent. Maybe the best food in Hot Springs. We sat at the oyster bar and the service and conversation with the bar tender was great. We were surprised that the menu online (it said Hot Springs) is not the same as the menu at the restaurant. I mentioned it to the wait staff and was told that's not their menu so they are aware. Pork chops were good, but the blackened ribeye was very fatty and a little tough. Our server was very attentive. We probably won't be back, but give it a try and see what you think. Be prepared to spend some money for your experience. We made our reservation through OpenTable.. Seated upon arrival and Savannah was our server. She was outstanding. Very attentive but not overwhelming. The Ahi Tuna was cooked perfectly and the Scallops were outstanding. The wine list is desirable also. We would recommend 501 Prime and we will be back on our next visit to Hot Springs. Great location and great menu. First time at 501 Prime and won't be the last!! When you splurge on dinner it's only fun if the food and service are outstanding--it was! There were three of us and the server was happy to bring extra plates because we decided to share two entrees. Thx! Be sure to finish the evening upstairs with a Lemon Drop martini. Absolutely the best I've ever had due to the quality liquors used. Food was outstanding ! Congrats to Matt and crew. Delicious oysters on the half-shell. Spare rib special with horseradish mashed potatoes was outstanding. Excellent service all around. Will definitely be back to 501 Prime when I'm in Hot Springs! I had scallops which were outstanding. Came with corn polenta and asparagus which were both excellent. House chardonnay at $6 a glass was reasonable. My wife had Hawaiian rib eye, which was tasty and nicely medium rare, but had way too much fat on it. Her house Pinot Grigio was $10 a glass. Deserts of crème broulet and chocolate cake were very good. Service was outstanding. Our waiter went way out of his way to accommodate special requests from our dinner companions. The music was too loud and included commercials, but when we aske our waiter if he could do anything about it, it got switched to a commercial free channel and was a little less loud. It wasn't our idea of fine dining music. All in all, it was a very pleasant experience despite the minor gripes. We would definitely return. Food was excellent, service was excellent, and the inside of the restaurant was very nice. The free valet parking was nice as well. The prices were a bit high; I wouldn't bring my kids here, but it's more of an "adult" restaurant anyway. Great choice for a special occasion meal. Service was great. Food and drinks were great. Only negative was I wasn't crazy about the table location...two seat right beside wine cellar near entrance. Hostess and wait staff were pleasant and friendly. Worked to accommodate our group of six on a busy night. We had a variety of menu items and everyone was happy with their food. Grilled vegetables side is very good. Steaks, salmon and scallops were cooked properly and were served timely. We will definitely go back here. Our ribeye steaks were only 50% edible due to all the fat on each of them. The lobster bisque was very thin. It would have been edible had it been served with a spoon. We were not able to find our server to request a spoon. Finally another employee came by and saw our problem and brought one. Of course by that time the bisque was totally cold. For this price meal, you expect better. Beautiful interior. Great service. My wife had the tuna which was just fair. I had the pork chop that was huge. Good taste but a little too dry. Presentation awesome. High price for average food. The food is great and the service is friendly and attentive. The food was delicious. Portions were generous and very well priced. Loved the upstairs bar! My only complaint is that the alcohol is way overpriced. I had a dirty martini and my fiance had whiskey and coke. This totaled $27.00 with a small tip for two drinks. Way too much in my opinion. Excellent food and excellent service. Would eat here again. The food was amazing, service spectacular, and experience top notch! Proud that Hot Springs has this fine dining option!